The pattern is for an ice cream pint cozy but has adjustments to make a beer bottle cozy as well. We’ve all done it: taken the pint of ice cream out of the freezer, pulled a spoon out of the drawer, and sat down in front of the TV. Before you know it your hand is really cold. Haven’t you ever wondered what you could do to prevent the hand freeze? Wonder no more. Go ahead, indulge in the pint. 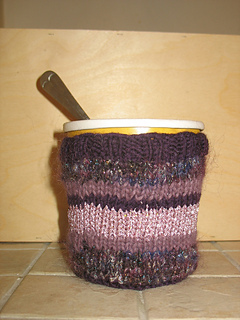 This is a quick project and a great way to use up some yarn from your stash! It only takes a few hours to make and would be a fabulous last-minute present.